That’s right, this 777-9 won’t ever make it to the skies. Instead, it will undergo an intensive year of testing on-the-ground to ensure it’s actually fit for flight. Think broken wings, freezing temperatures, electrical charges: this bird is about to undergo a life of torture. It’ll be 2019 before a 777X actually takes to the air for flight tests. 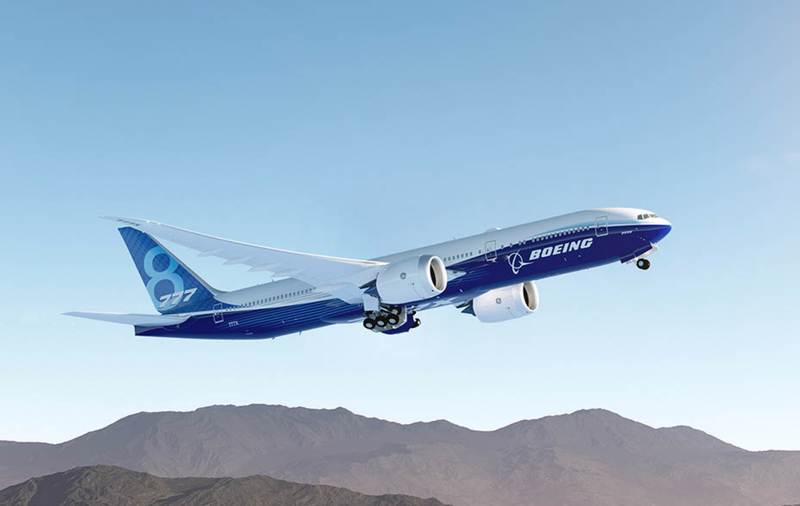 Every new aircraft debut is important, and the 777X aircraft for Boeing is no exception. The 777X is a reinvented version of the most successful single generation wide-body jet ever built. Boeing has sold more original 777 jets than the first four generations of Boeing 747 combined. That’s an incredible track record of success, considering many airlines still show off the 777-300ER as a gold-standard fleet centerpiece. The 777X project constitutes the first 777 redesign in over 20 years of continual 777 service. The iteration that will debut first in early 2020 is the 777-9. This long-boy is a stretched derivative of Boeing’s current 777-300ER with a capacity of 400 to 425 passengers, depending on configuration. This is an utterly huge twin-engine airplane, larger than the legacy Boeing 747 variants, which held the aircraft capacity record for 37 years. Launch carriers for the 777-9 include All Nippon Airways, Cathay Pacific, Emirates, Etihad Airways, Lufthansa, Qatar Airways and Singapore Airlines. Then, approximately two years after the 777-9, its (slightly) littler brother will make its inaugural flight. The 777-8 will be a successor to the original 777-200. Capacity on this aircraft will be around 350-375 passengers, about the same size as the current 777-300. This is a considerable up-guaging, as Boeing’s 787 Dreamliner has taken over what was the smaller end of the 777 lineup. The new planes will be the “largest and most efficient twin-engine jets developed in commercial history,” per the folks at Boeing. To fit these aircraft into existing airport gate spaces, Boeing is using a first-ever “folding wingtip” design that will also boost fuel efficiency—12 percent more so than its main rival for the 777-8 variant, the Airbus A350-900. And a big benefit of the folding mechanism is that the 777X will be able to taxi and park at any gate that the current-generation 777 does. This is a huge upside for the 777X-9 over the Airbus A380, which needs a special (and costly) airport gate reconfiguration and can only land at a handful of U.S. airports. These new 777s will hold nearly as many passengers and can land pretty much anywhere with a long enough runway. Passenger comfort should be much improved over the current generation, also. 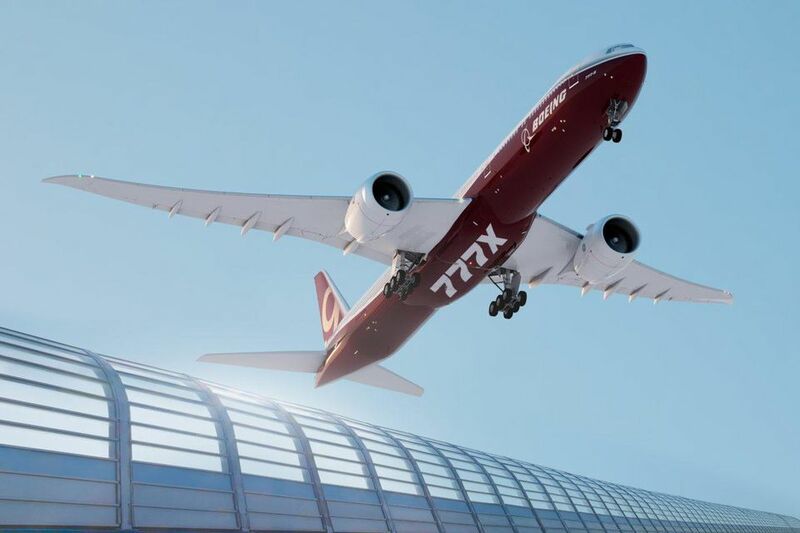 The 777X will have increased composite use in the fuselage and wing superstructures, will be pressurized to lower altitudes (like the 787 Dreamliner) and will have quieter, redesigned engines. The new jets will feature the Boeing Sky interior design currently used on the Dreamliner and 737MAX jets. Boeing is relenting to increasingly inevitable airline choices and have designed the new 777s to accommodate 10 abreast standard economy seating. The engineers at Boeing — optimists as they are — made the legacy 777 cabin just wide enough to give economy passengers, seated nine-across, 19-inch wide seats, the widest of any commercial airliner. Those optimists at Boeing did not foresee later decisions by stingy aircraft executives to cram an additional seating column, shrinking widths to regional-jet specifications in a 3-4-3 layout. While this is quickly becoming the norm on many airlines on the current-generation 777, a 3-4-3 configuration will indeed become the standard on this new triple 7. The engineers have designed the 777 to accommodate that bigger cabin layout with in wider seats — we’ve seen 17.4-inches to 180-inches. Those figures aren’t as grandiose as the original 777 designs, but comparable to the 3-4-3 seating on the beloved 747. Interestingly, the fuselage diameter will remain the same as the current model. Instead, Boeing has reduced the thickness of interior while sculpting side walls to add width to the cabin interior, thus accommodating wider seats. On the bright side, it’s highly unlikely airlines will be able to feasibly cram another line of seats into this cabin, meaning passengers should indefinitely enjoy a decent amount of shoulder space on the 777X. Notice the 19″ width on SIA’s 777 economy class seats. Reminiscent of the good ‘ole days. It won’t be long before the 777X makes its official flying debut. Airlines seem to like it: over 300 777X’s have been ordered already. However, like Boeing’s 787, seats for the 777X in the standard configuration will be narrower than Airbus’ A350 counterpart. However, I’m still very much excited for this new airplane and to experience retractable and folding wings first-hand. This first Boeing might not be going yet, but it will very soon. Should You Add Perth to Your Australian Vacation Itinerary?